You just had a dose of free software in my last post. 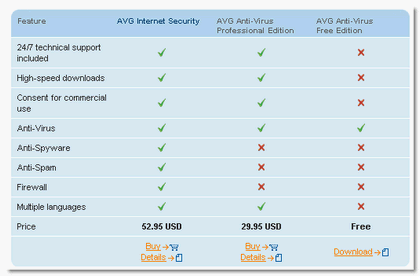 AVG Anti-virus is one of the most popular free anti-virus products out there. But, free doesn’t mean free as in beer like most open source software but comes with some limitations but usually enough for an average home user. ComputerActive is giving away free licensed copies of AVG Anti-virus Professional Edition until January 17th 2008. It is priced at $29.95 for a yearly subscription. Here are the difference between the FREE edition and a PRO edition. What do you use for an anti-virus in your computer? Will you try AVG Professional Edition? K, I use Avast and am happy with it. I’ve also used AntiVir in the past and it was okay too – but I gave it up because it conflicts with my Internet connection software. I better point out that this is probably the fault of the internet connection software which is pretty intrusive (my ISP is trying to stop students sharing an Internet connection in their dorms), but I don’t have much choice here! I have serious man-love for Avast. I ran with AVG Free Edition for a little while. I wasn’t unhappy with it, but Avast is head and shoulders better in my opinion and works in the background better. I’ve heard lots of good things about Avast. I’ve been using AVG for a long time but I might just try Avast. Doh, sounds like your post about AVG convinced Baron to try Avast. Seriously though, Baron, all I ask is that you try Avast for a few weeks and see if you like it better (on a 2nd computer or something if you have one). I haven’t had a single person switch back to AVG yet, though they were comparing it to the free version. Kyle.. isn’t that funny. LOL I am with you recommending Avast. I have good luck with ClamWin as well.